(NaturalNews) Mainstream media clamor for mandatory vaccines, ignoring official statistics that show the drug is more dangerous than the disease. Should government force parents to vaccinate their children? Of course, the establishment media has entirely ignored these figures in the wake of the recent Disneyland measles outbreak. As of mid-February, the number of confirmed measles cases had climbed to 113, prompting vicious attacks from mainstream media against "anti-vaxxers." In the cross hairs are parents who choose not to vaccinate their children, even though CDC officials say the epidemic was likely introduced at the Disneyland theme park by a person infected with measles overseas. USA Today even published a screed encouraging the jailing of parents who refuse to vaccinate their children, though it was not clear whether the Amish and other religious communities would be included in the proposed mass roundups. Now, elements of the "mainstream" media are engaged in a damage-control effort. Media reports repeatedly and erroneously maintain that measles could not spread in a fully vaccinated society, while assuring readers of the safety and effectiveness of vaccines. In some cases, as with the New York Times, even the media's sources have lambasted reporters for deceiving readers with propaganda. "It seems clear to me that your reporters or writers knew exactly how they wanted to frame this story before they even conducted the interview with me, and when what I actually said didn't fit well into that story, they had to dissect and then re-combine my words in order to make them fit the intended picture that they either expected or wanted to convey," said Kelly McMenimen, the mother of an unvaccinated child whose interview was distorted, in an open letter to the Times editor. It is significant to note that, despite its reassuring jargon, the federal government's vaccination-promoting website, Vaccines.gov, chooses to ignore most pre-1963 numbers. Instead, it displays a graph illustrating the decline in overall U.S. measles cases -- with no distinction of measles deaths -- since the inoculation was introduced, a decidedly deceptive omission of earlier years' data. However, the VAERS database reveals a markedly different history of the measles vaccine. After a painstaking search through this federal database of adverse effects, Shilhavy reported, "The search result contained 108 deaths over this period [i.e., 2004 to 2015 -- ed. ], resulting from four different measles vaccines sold in the United States during the past 10 years." He continued, "This database reflects only deaths that were reported during the time frame, and therefore probably reflects a much lower number than actual deaths, since most doctors and health authorities believe vaccines are safe, and would not normally attribute a death to a vaccine and actually report it." Indeed, results of a 2006 meta-analysis in the health journal Drug Safety reveal that adverse drug reactions go unreported at an alarming rate of 94 percent for prescription medications in general. And while the VAERS cautions that its reports of adverse effects do not necessarily establish a cause-and-effect relationship, and at least some of the reported deaths were probably not directly linked to the shot, the high rate of under-reporting reveals that the system almost certainly underestimates rather than overestimates the true death count. Unsuspecting parents and doctors -- convinced that vaccines are entirely safe -- would be unlikely to link them with sudden death, even though vaccine package inserts clearly warn of possible death or serious injury as a potential side effect. At least 77 claims have been filed with the federal National Vaccine Injury Compensation Program for deaths caused by the measles inoculation, along with over 1,000 for serious injuries, with almost 40 percent being compensated by taxpayers and 7.4 percent of cases still unresolved. Over 15,000 claims have been filed against vaccines more generally, so some of those harmed by a cocktail of vaccines that included the measles shot would likely not be included in those figures. But now that the facts have gone viral, the largely discredited Snopes.com website is trying to discredit the facts. In its effort, the radically pro-government website has mostly attacked straw men while relying on data from Third World countries with widespread malnutrition and a dearth of basic healthcare services. It also contests the official death toll from measles cited by the CDC since 2004. Snopes chose to rely on "preliminary data" for 2009 and a 2010 CDC report claiming four people in the last decade have died from measles, though Dr. Anne Schuchat, the director of CDC's National Center for Immunization and Respiratory Diseases, told the Associated Press last year that there were zero reported deaths from measles. Separately, the CDC Division of Viral Diseases said in an e-mail that the "last documented deaths in the U.S. directly attributable to acute measles occurred in 2003." No matter which numbers are used regarding vaccine deaths and measles deaths, though, the death toll from the shots is higher in the United States over the last decade. Meanwhile, financially strapped Newsweek, a Big Pharma-supported magazine still attempting to recover after it was sold for one dollar in 2010, also piled on. In an error-riddled propaganda piece, the online outlet made the unsubstantiated statement that "it's true some people may have died as a result of the measles vaccine" but "many more would have died without them." The article cited only United Nations statistics of Third World countries, but no data from the United States, even that which is publically available. Unsurprisingly, the CDC claims its vaccination program "eliminated" measles in 2000. "The United States was able to eliminate measles because it has a highly effective measles vaccine, a strong vaccination program that achieves high vaccine coverage in children and a strong public health system for detecting and responding to measles cases and outbreaks," the CDC argued. However, the disease still crops up annually because travelers, immigrants, and illegal aliens bring it to our shores from foreign soil. The National Vaccine Information Center, a non-profit educational organization and patient advocacy group that opposes government mandates on the issue, also points out on its website that the vaccine does not necessarily protect a person from measles, contrary to a false narrative pushed by misleading establishment press articles and bureaucrats. "Evidence has been published in the medical literature that vaccinated persons can get measles because either the measles vaccine fails to provide temporary vaccine-acquired immunity or the vaccine's effectiveness wanes over time," it reported. Especially problematic: Vaccines may provide temporary protection but wear off, leaving adults vulnerable to measles at a later stage in life, when the disease can be far more harmful. Though most Americans might not know it, countless medical professionals have spoken out about the issue for decades. "After frightening you with the unlikely possibility of measles encephalitis, your doctor can rarely be counted on to tell you of the dangers associated with the vaccine he uses to prevent it," explained the late Dr. Robert Mendelsohn in his health newsletter. "The measles vaccine is associated with encephalopathy and with a series of other complications such as SSPE (subacute sclerosing panencephalitis), which causes hardening of the brain and is invariably fatal." "Other neurologic and sometimes fatal conditions associated with the measles vaccine include ataxia (inability to coordinate muscle movements), mental retardation, aseptic meningitis, seizure disorders, and hemiparesis (paralysis affecting one side of the body)," Dr. Mendelsohn continued after explaining that, in the developed world especially, measles is hardly a deadly plague requiring national paranoia and vaccination at gunpoint. "Secondary complications associated with the vaccine may be even more frightening. They include encephalitis, juvenile-onset diabetes, Reye's syndrome, and multiple sclerosis." In fact, still today, the package insert in the measles vaccine specifically warns of the potential for many of those problems and numerous others. "I would consider the risks associated with measles vaccination unacceptable even if there were convincing evidence that the vaccine works," the late, prominent medical doctor concluded. "There isn't." More recently, numerous high-profile doctors and experts have made similar statements, despite the overwhelming pressure and threats from government and Big Pharma to remain silent on the risks. Indeed, unlike virtually any other product or industry in the United States, the federal government protects vaccine manufacturers from liability when their products kill or injure patients. This forces victims of vaccine-related injuries -- or the families of those whose deaths are linked to vaccines -- to rely on the taxpayer-funded U.S. Vaccine Injury Compensation Program (VICP), rather than suing the companies that produced and sold the potentially dangerous product. With many vaccines worldwide now manufactured under World Health Organization approval in Communist China, infamous for producing dangerous and deadly products, the seriousness is even greater. "Why does our federal government protect vaccine manufacturers from product liability lawsuits?" MaryJo Perry, co-director of Mississippi Parents for Vaccine Rights, asked in an online USA Today post on January 27. She noted that taxpayers have been funding the U.S. Health and Human Services Administration's VICP since 1989 to the tune of $3 billion paid to victims of these reputedly "safe" medical products. "When citizens can't hold corporations accountable in court for the safety and effectiveness of vaccines, it is very important to protect our legal right to vaccine exemptions," Perry states. Barbara Loe Fisher of the National Vaccine Information Center agrees. "From now on -- unless we stand up and draw the line on vaccine mandates -- the government can legally use police powers to force every American to get hundreds of vaccinations or be punished," she writes, "while those who are hurt by vaccination can be more easily swept under the rug and left to fend for themselves." The National Vaccine Information Center highlights a number of vaccine injury statistics that again have been glossed over by the press. "As of January 5, 2015, there had been 946 claims filed in the federal Vaccine Injury Compensation Program for injuries and deaths following MMR vaccination, including 57 deaths and 889 serious injuries," the center reported. When other measles vaccines aside from the MMR are included, the numbers are even higher. "Using the MedAlerts search engine, as of December 14, 2014 there had been 6,962 serious adverse events reported to the Vaccine Adverse Events Reporting System (VAERS) in connection with measles-containing vaccines since 1990," the Vaccine Information Center continued. "Over half of those serious measles vaccine-related adverse events occurred in children three years old and under. Of these measles-vaccine related adverse event reports to VAERS, 329 were deaths, with over half of the deaths occurring in children under three years of age." What motivates groups such as the Mississippi Parents for Vaccine Rights and National Vaccine Information Center is the threat of government-mandated vaccines, a troubling factor considering our current regulatory environment. Numerous state and federal measures are already in place to strip personal liberties in the name of protecting public health. Roughly 80 percent of states across the nation have, since 2002, implemented in varying degrees the Model State Emergency Health Powers Act, developed by a collaboration of government entities including the U.S. CDC and the UN World Health Organization. The act grants tremendous powers to states at the expense of personal privacy and individual freedom, allowing forced involuntary quarantines and government-mandated vaccinations during officially declared "emergencies." On the federal level, the Public Health Service Act (PHSA), along with executive orders signed by Presidents George W. Bush and Barack Obama, established broad federal quarantine authority. In the event of public resistance to such draconian measures, Obama is prepared to deploy the military to enforce these unconstitutional policies. His Department of Defense (DoD) Implementation Plan for Pandemic Influenza includes "the provision of DoD assistance to civilian authorities both foreign and domestic." In other words, a bureaucrat could deprive a U.S. citizen of his unalienable rights -- for as long as said bureaucrat considers necessary -- on the mere suspicion that the person being detained has been in contact with some disease. Contrast the purported federal authorities under the Public Health Service Act with the plain language in the U.S. Constitution's Fifth Amendment, which outright prohibits the deprivation of liberty without due process of law -- a timeless and essential principle enshrined in the Magna Carta almost 800 years ago. State constitutions across America recognize those fundamental rights as well. But desperate times call for desperate measures, right? Shouldn't we be willing to part with personal liberties in the interest of public health? Aren't diseases such as measles far worse than the prospect of forfeiting the Fifth Amendment? We will deal with the legality issue shortly, but first let's consider a few points about vaccinations in general and measles in particular. First, measles is very rarely fatal, and most people recover completely. 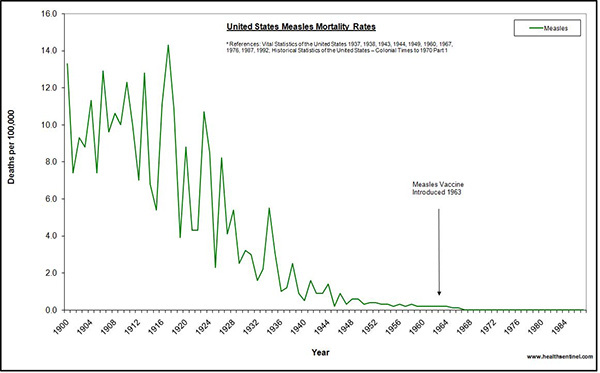 As noted earlier, between 1920 and 1955, the rate of deaths among U.S. measles cases dropped from 0.01 percent to 0.00003 percent without any help from vaccinations. Even today the global mortality rate from measles is very low at 0.00328 percent. These numbers are not meant to downplay the tragedy of individual deaths but to illustrate that we are not talking about a killer such as smallpox, so lethal that it has been used as a biological weapon of war since ancient times. One of the main reasons for the steep early 20th-century decline in both measles cases and measles deaths was that doctors discovered the efficacy of cod-liver oil, which is rich in vitamin A. The New England Journal of Medicine confirmed in 1990 that vitamin A is essential in measles treatment and declared that "all children with severe measles should be given vitamin A supplements, whether or not they are thought to have a nutritional deficiency." And while vitamin A proves itself an effective therapy and protection against contracting the disease, the measles vaccine cannot promise the same. Which brings us to the question of vaccine safety and effectiveness in general. Researchers may call a vaccine "effective" simply because it causes the injected person to develop antibodies. However, "it is important to understand that effective and protective in vaccine research are not synonyms," explains Dr. Sherri Tenpenny, a medical doctor and outspoken critic of vaccines. (Emphasis in original.) She cites the package insert of the HiBTiter® flu vaccine, which states that "the contribution [antibodies make] to clinical protection is unknown," and CDC literature about the pertussis vaccine, which admits, "The findings of efficacy studies have not demonstrated a direct correlation between antibody response and protection against pertussis disease." This effective-vs.-protective distinction explains how outbreaks can occur in fully immunized populations, such as the 1985 measles epidemic in a school in Corpus Christi, Texas. And as noted earlier, a number of cases in the current California outbreak involve previously immunized patients. Long before that, the trends were similar. In 1967, for example, the UN World Health Organization declared that Ghana was measles-free after 96 percent of the population was vaccinated. But just five years later, the country suffered its most deadly outbreak of the disease. More recently, a 1990 article about measles in the Journal of the American Medical Association pointed out: "Although more than 95% of school-aged children in the US are vaccinated against measles, large measles outbreaks continue to occur in schools and most cases in this setting occur among previously vaccinated children." Dr. Tenpenny recalls that she was drawn into the debate years ago when she realized that "tens of thousands have been injured and have died as a result of vaccinations." Among health problems that many parents and healthcare professionals fear could be associated with vaccines are autism, sudden infant death syndrome, allergies, juvenile diabetes, and childhood arthritis. Yet Vaccines.gov claims, "Vaccines are some of the safest medical products available." It follows that the anti-vaccination movement is made up of parents who are inexcusably gullible and criminally irresponsible -- guilty of both child abuse and endangering society with their foolhardy negligence. So goes the party line. After all, say the pro-vaccine media, measles could find no susceptible host in a fully immunized population but can only gain foothold in, and be spread by, unvaccinated people. Reputable sources, and even the CDC, expose the fallacy of such yellow journalism. Moreover, parents who reject vaccines do so out of love for their children and have morally and scientifically valid arguments. Jane Orient, M.D., executive director of the Association of American Physicians and Surgeons (AAPS), explains that many people object to vaccines that are manufactured using cells from aborted babies. Such is the case with Merck's ubiquitous MMR (measles-mumps-rubella) product, as Orient pointed out in a February 9 statement on the AAPS website. Parents also worry about chronic adverse health conditions associated with vaccines, in particular, autism. While the mainstream press scoffs at any association, Orient notes that the rates of autism in children have climbed precipitously since the dawn of the MMR vaccine: from 1 in 10,000 children to 1 in 85. "Many factors may well contribute, but it is not unreasonable to suspect that MMR is one of them," she argues. "Measles itself can cause encephalitis (brain inflammation) -- its most dreaded complication. MMR is a live-virus vaccine. And the combination could be riskier than the separate elements." These concerns underscore the importance of preserving patients' rights to refuse medical treatment, and the reality that all medical interventions carry both benefits and risks. Regardless of whether an individual opts for or against a particular vaccine, the critical point is this: Government has no right or authority to mandate vaccines. AAPS clarifies the importance of the distinction. "Mandatory vaccines violate the medical ethic of informed consent," states the organization's Fact Sheet, which also explains that the group is not opposed to vaccines and has never taken an anti-vaccine position. It is, however, firmly opposed to government policies that violate parental informed consent. "A case could also be made that mandates for vaccines by school districts and legislatures is the de facto practice of medicine without a license." Government-required vaccines amount to a gross violation of privacy rights and personal freedom, as well as abuse of the doctor-patient relationship. In a 1999 statement to the U.S. House Government Reform Committee, Orient explained, "The relationship of patient and physician is shattered; in administering the vaccine, the physician is serving as the agent of the state." In that role, a doctor is forced to violate the time-honored Hippocratic Oath whereby he swears to act in the best interests of his individual patient, a principle reflected in the AAPS motto: Omnia pro aegroto ("All for the patient"). "Instead, he is applying the new population-based ethic in which the interests of the individual patient may be sacrificed to the 'needs of society.'" Orient stated that government-mandated vaccines mark a shocking reversal of traditional public health policy. In the past, authorities restricted individual liberty "only in case of a clear and present danger," such as a quarantine of individuals infected with a dangerous communicable disease. "Today, a child may be deprived of his liberty to associate with others, or even of his supposed right to a public education, simply because of being unimmunized," said Orient. It does not matter that he is uninfected or that he poses no "clear and present danger." He is guilty until proven innocent -- or in this case, until immunized. AAPS is not alone in its defense of informed consent to medical treatment. The National Vaccine Information Center explains that the principle of informed consent "has become a central ethical principle in the practice of modern medicine and is applied to medical interventions which involve the risk of injury or death." 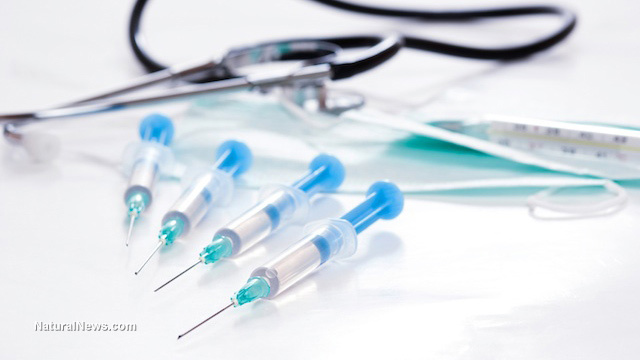 NVIC's members believe no exception should be made for vaccines, since the group is composed of parents whose children have been injured or have died from reactions to them. Despite establishment media efforts to manufacture unwarranted hysteria and demands for "medicine at gunpoint," studies and experts suggest that the approach may backfire in a major way. For one, more parents will become aware of the controversy though they may never have realized that medical professionals and studies have found vaccines to be far less than totally safe and effective. Plus, with trust in government at historic lows, any PR efforts by politicians, lobbyists, and bureaucrats are almost assured to generate a backlash and fresh suspicions. That is unquestionably a positive development -- especially when it comes to vaccines. Parents and patients should have all available information prior to giving consent and making important medical decisions in consultation with their doctors.